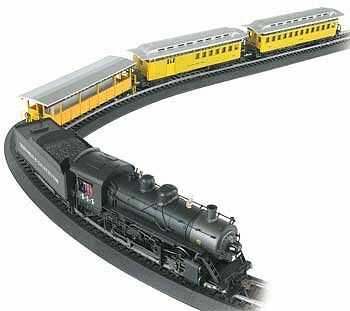 This is the Durango & Silverton Complete & Ready to Run Electric Train Set from Bachmann. Suitable for Ages 14 & Older. Retail $329.00 SAVE 37% ! I have this set. I also think the locomotive looks better on 22 inch radius curves. 2-8-0 locomotive and tender with operating headlight. 47" x 38" oval of snap-fit E-Z Track.